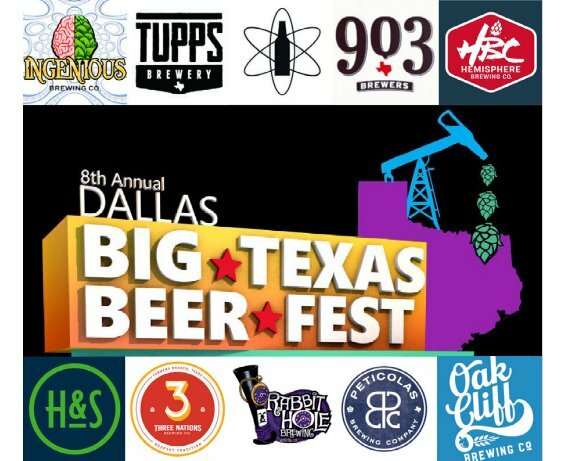 Hop & Sting Brewing Co., 3 Nations Brewing Co., Rabbit Hole Brewing, Peticolas Brewing Co., Oak Cliff Brewing Co.
Amidst Mother Nature's apparent struggle to keep the seasons straight, a beer festival broke out this past weekend in the form of the eighth annual Big Texas Beer Fest (BTBF). The meandering mercury had attendees reaching for a cold one on a warm Friday night, while Saturday's climate called for a barrel-aged stout to help stave off the chill. Naturally, it being a beer fest, there were options aplenty for both extremes and everything in between. You could even indulge in other types of refreshment, with a variety of ciders, hard seltzers and kombucha available, not to mention the appearance of a non-alcoholic beer hustler looking to show off its new Heine. Regarding the featured beverage, the event boasted more than 400 beers from over 90 breweries. Nearly two-thirds of those brewing companies hailed from the Lone Star State, with 50 coming from North Texas. Indeed, whereas early editions of BTBF had to lean on national brands to populate the beer list, it's now Texas brews taking center stage. Of course, that's a function of the market more than anything else. There's no getting around the fact that changes in demand have lead to changes in the portfolios of both breweries and distributors. Many breweries aren't making the same beers compared to when they first opened, and there are fewer national brands being shipped to the local market. As for what's popular from year to year, one need only track the trails of consumer taste. And, what better place to do that than BTBF? For, while the event has proven to be a grand showcase for products offered by the local industry, it has also served as a platform from which to witness the evolution of the local craft beer scene. So, with that in mind, this year's collection of festival favorites is presented in a slightly different format, with a bit of background on what's behind the beers you're imbibing. Once upon a time, the West Coast IPA was the belle of the craft beer ball. However, its popularity has waned recently in favor of the juicy and hazy IPA stylings of New England. Lines forming to sample such beers at BTBF were a testament to the shifting IPA dynamic, with breweries like Celestial Beer Works, Ingenious Brewing Co., Manhattan Project Beer Co., Turning Point Beer and Tupps Brewery serving up a variety of NEIPAs to sustained crowds around their booths. Notable pours: Ingenious Mango Creamsicle Double FroYo, Manhattan Project 10 Nanoseconds, Tupps DDH Series 9. At some point, rotating ingredients into a standard stout recipe became a popular thing. Stout variants help breweries keep things fresh for consumers always on the lookout for something new, and for a while Lakewood Brewing Co. cornered the market on this approach by way of The Temptress. Lately, though, other breweries have thrown their hats into the ring, with product lines being built around beers like 3 Nations Devout, 903 Sasquatch, Oak Cliff Sombre and Tupps Full Grown Man - all of which were served in one form or another at this year's BTBF. Notable pours: 3 Nations Devout Bananas Foster, Oak Cliff Sombre - Canadian Tuxedo. Judging by options poured at BTBF, bourbon barrels are still the vessel of choice when it comes to barrel aging beers, but there were other treatments to be found on the festival floor. This year, fest-goers were able to sample beers aged in Bordeaux, clean oak, rum, tequila, white wine and (my personal favorite) brandy barrels. Notable pours: 903 Dracarys Oak-Aged Imperial Mexican Style Stout, Hemisphere Bourbon Barrel-Aged Black Sacrament, Hop & Sting Barrel-Aged Frigid Underworld, Rabbit Hole Hatter's Revenge - Brandy Barrel-Aged Golden Strong Ale. While it almost certainly won't always be the case, it was ironic to see Peticolas Brewing Co. choose something old - a märzen - as its first "What's New" beer. A märzen is a German beer that's been around for nearly 500 years and, believe it or not, some still seek out classic styles. Perhaps what they say is true...the more things change, the more they stay the same. Notable pour: Peticolas What's New #1: Märzen.